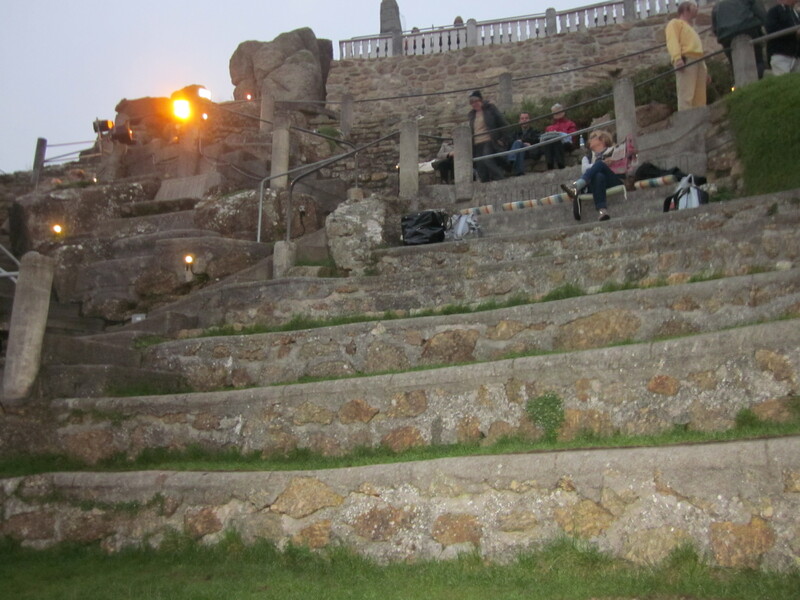 Number three on the five-step program to complete Cornish enlightenment is a visit to the Minack Theatre. In the winter and spring of 1932, the visionary Miss Rowena Cade—with the aid of her gardener, Billy Rawlings, and his mate, Charles Angove—cut out the granite steps by hand, filled the seating terraces with earth and small stones, and built a simple stage. That summer they put on The Tempest, with the stage lit by car headlights and power provided by a cable from Miss Cade’s house on top of the cliff. Some eighty years later, people travel from all over the world to experience firsthand the remarkable Roman-style open-air that Rowena had envisaged. Just visiting this theatre does not do it justice: you have to see a live performance. I can safely say that in all my worldly travels, I have yet to witness a more surreal and stunning setting. Carved into the cliff overlooking Porthcurno beach, the Minack offers magic and drama even when the actors are offstage. For those lucky enough to visit the Minack for a performance*, do note that you need to be prepared for all weather. I’ve passed several evenings at the Minack along the following lines: we begin with a perfect sunset which fades into as a clear moonlit evening, enhancing a superb stage performance…add the faint echo of the crashing waves below and you have what can only be described as theatre paradise. But lo and behold things can change quickly! The wind has picked up, it’s now blowing a gale, the heavens have opened and rain is lashing down—a veritable tempest of Shakespearean proportion! But in true British—or should I say Cornish—spirit everyone just keeps calm and carries on, no one has left, people have just put their hoods on (umbrellas are not allowed in the theatre), and the audience claps and cheers each dance or scene. 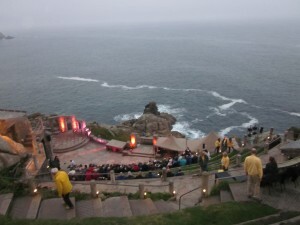 When I first witnessed this inclement weather in a performance, I spent most of the evening watching in blind panic, afraid that one of the cast members was going to end up over the cliff, having slipped on the wet stone stage. Thankfully the show completed without any injuries. These performers know their marks! 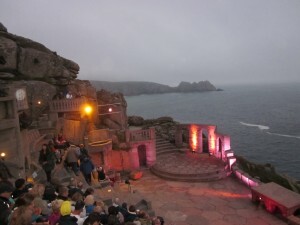 The Minack Theatre only ever cancels performances in extreme weather conditions, which means the weather would have to be really, really bad for that to happen…all of which is a long way of saying, Don’t forget your raincoat! In closing, I apologize for my story starting with bad weather. It’s just our British style, it’s the way we are brought up, this storytelling art form has been handed down from generation to generation, or from one bad weather day to another…. * For those booked on the 2014 tours I am sure we will be able to tweak our schedule and take in an evening performance.